Smooth Surface Pressrue Fuel Line and Vapor Emission Hose SAE 30R7 Product Application of Smooth Surface Pressrue Fuel Line and Vapor Emission Hose SAE 30R7 Our products are popular in the demestic market, at the same time, we enjoyed a good reputation from the foreign customers. This hoses are extensively used to mining, metallurgical, oil, project machinery, chemical, agriculture field. E.g. Mine hydraulic fluid, oil exploration, crane, forging metallurgy, mining equipment, ships, injection molding machinery, agricultural machinery and various machines tools. 2. High pressure flexible hose bear high pressure, pulse performance is superior. 3. 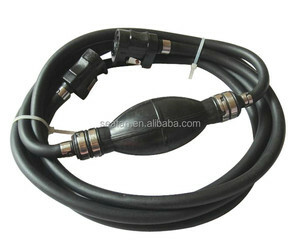 High pressure hose body is tight, soft, small deformation under pressure. 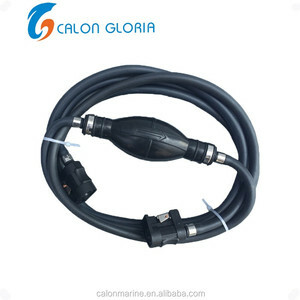 4.Hydraulic Hose has excellent resistance to winding and fatigue resistance. We have much experience of exporting and we produce the best quality oil hose. Packing Packing :After finishing the hose production, we will pack the hose. After production,we test each hose to guarantee 100% qualification. Guangzhou Weshare Auto Parts Co., Ltd.
high quality auto fuel line 5/16 inch sae 30 r9 16mm red oil hose Reinforcement : High tensile polyester fiber braided. Temperature : -30&#8451; to +100&#8451; Application : Mainly used for the transfer of unleaded, leaded, diesel & E10 fuels. Standard length : 50m, 100m. Wenzhou Lianfa Flange & Fitting Anhui Co., Ltd.
High quality product and customer's satisfaction is our pursuit. Machine system, knife and inspection tools are all imported from Japan. We use Techmaflex Crimping Machine which is imported from France. Beijing Proleader Tech Co., Ltd.
8.Temperature :-40`C~+50 9.Use : apply to delivery gasoline, coal oil, diesel oil, machine oil, lubricant, and other mineral oil. 10.Inforcement : to be made of cloth or fabric spiral or fabric braided according to different working pressure. HOSE PACKING: Why us9 1. We can design the perfect hose suit to your application . Fujian Jingcheng Seiko Machinery Co., Ltd.
Alibaba.com offers 18,328 fuel line products. About 8% of these are rubber hoses, 1% are plastic tubes. A wide variety of fuel line options are available to you, such as free samples, paid samples. There are 18,283 fuel line suppliers, mainly located in Asia. The top supplying countries are China (Mainland), Taiwan, and India, which supply 97%, 1%, and 1% of fuel line respectively. Fuel line products are most popular in Domestic Market, Africa, and South America. You can ensure product safety by selecting from certified suppliers, including 6,372 with ISO9001, 3,936 with Other, and 1,042 with ISO14001 certification.